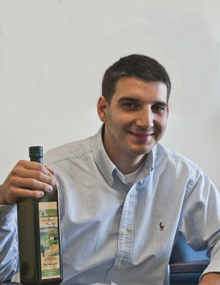 Merrick School of Business senior and international business major Dimitrios Komninos didn’t wait until graduation to help expand his family’s century-old business in Greece. Taking the idea of “learning on the job” to new heights, he seized the opportunity to import high-quality olive oil from the source—his family’s farm near Sparta—and greatly expand the market reach of the family business. Now entering its fourth generation, the Giannakos family, of which Komninos is a scion, has been producing extra virgin olive oil since 1904. Their picturesque 60-acre parcel of olive groves is located in the foothills of Mt. Taigetos. Komninos’ stepfather, Dimitrios Giannakos, and his family produce the oil using a “cold press” manufacturing method. This unfiltered production process ensures the purest of all virgin olive oils, and eliminates the chemically-treated process that is part of most refined olive-oil production. A key part of this method is letting the oil sit in tanks for 45 to 60 days, during which natural settling occurs and sediment sinks to the bottom. The oil is naturally purified in this way, which makes it great for healthy cooking and eating. In 2007, Komninos and his stepfather decided to bring the product to the U.S. They formed Greek Super Foods, LLC, and got to work. When asked about the challenges that arise when working in a family business, Komninos says that starting a small family business that involved importing a product from abroad presented a whole range of obstacles. Today, Greek Super Foods sells the olive oil at local farmers markets, including the Waverly market next to Union Memorial Hospital, the Bel Air market, and the JFX market on Sundays. Komninos’ stepbrother, Omiros Giannakos, is helping the company by making inroads into farmers markets in northern Virginia. They also sell oil to numerous restaurants in Maryland, the District of Columbia, and northern Virginia. In Baltimore, Graul’s Market carries the product.